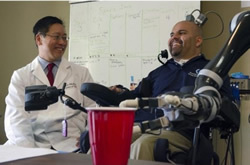 A man paralyzed by gunshot more than a decade ago can shake hands, drink beer and play "rock, paper, scissors" by controlling a robotic arm with his thoughts, researchers reported. Two years ago, doctors in California implanted a pair of tiny chips into the brain of Erik Sorto that decoded his thoughts to move the free-standing robotic arm. The 34-year-old has been working with researchers and occupational therapists to practice and fine-tune his movements.